The year is 1899 and the end of the Wild West era has begun. In the western American town Blackwater, a gang by the name of Van der Linde's robbery goes awry. 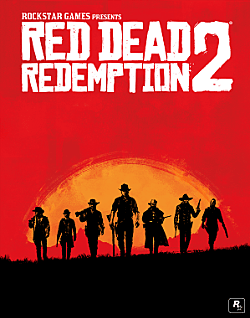 The story focuses on Arthur Morgan, and, as a member of Van der Linde in the wake of their actions, federal agents along with the best bounty hunters in the nation are hunting him and his gang down. Rob, steal and fight your way across the rugged American heartland to evade your pursuers and attempt to survive in the harsh territory. As tensions build and internal divisions intensify, Arthur must make a tremendous choice: Abide by his own ideals, or keep his loyalty to the gang that raised him. Most open-world games would benefit from having a map that's much, much smaller. Don't @ me. Red Dead Online's next beta update will add more for players to do and more customization options for their characters. The Pinkertons are not happy with their representation in Red Dead Redemption 2 and are demanding compensation from Take-Two. For some players, PvP griefers has been a problem since the release of Red Dead Online, and Rockstar will be addressing the issue with upcoming updates. Although GotY season's over, these three strategy DLCs should've been in the conversation. Here's why. For years, the games industry has been pushing the idea that games are now more of a service than a single, concrete product. There's one major problem -- and it's not really developers' fault. Be the fastest, most prepared cowpoke with this guide to Red Dead Online's horse races. Check this guide for the location of the Bard's Crossing treasure in Red Dead Online, which gives you 100 gold nuggets and more. Need to earn some quick cash to overcome the constant drain of stable fees? We show you sure-fire methods to build up a quick nest egg! Farm these money exploits in Red Dead Online to roll in the cash. This co-op guide covers everything you need to know about forming and using posses to play with friends in Red Dead Online. Fast traveling in Red Dead Online is almost identical to Red Dead Redemption 2 -- except for a few key wrinkles. Need gold nuggets to get gold bars to get a fancy new hat or a horse with more stamina? This is how you do it. If Red Dead Redemption Online is not working on Xbox or PS4, try these potential fixes before submitting a ticket to Rockstar support. Now that Red Dead Redemption's multiplayer component is live, players are taking no time sharing information on the various modes. Red Dead Redemption Online has story missions. Here's what we know so far. Rockstar has confirmed that RDR 2 Online will start recruiting gang members this week. As Rockstar's masterpiece comes to a close, we dish out some much deserved revenge, find our softer side, and say goodbye. In the Western's fifth chapter, we visit a new locale, take a haunting horse ride, and Arthur gets some bad news.